When Henry the VIII, King of all England, died in 1547, the busars took an exhaustive inventory of his belongings. They counted furniture, spoons, silks, armor, weapons, silver plates, and all the treasures of the king. In their final tally King Henry’s household (which doubled as the wealth of England) contained 18,000 objects. I live in a large American house which I share with my wife, three children, a sister-in-law, and two nieces. One summer my daughter Ting and I counted all the objects in our home. Equipped with a hand tally clicker and a clipboard she went from room to room pawing through kitchen cupboards, bedroom closets and desk drawers unopened for years. She added up each different type of object she found, large and small. Her count: We have 6,000 varieties of things in our house. Since we have multiple examples of some varieties, such as books, CDs, paper plates, and items like socks, the total number of objects climbs to close to 10,000. Most people alive today, or alive any time in the past, posses little compared to a king or myself. 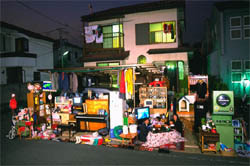 In 1998 Peter Menzel organized an expidition to photograph families around the world surrounded by all their possessions. He found families in 39 countries such as Bhutan, Haiti, Germany, Russia, Peru, willing to let Menzel’s delegates haul the entire contents of their home outside into the street or yard to be photographed, inventoried, and published in a book called Material World. Nearly every family was proud of what they possessed, standing happily in front of their dwelling amid colorful displays of chairs, etc.. The average number of objects owned by one of these families is no fewer than 127. There are several things we can say for certain about these different pictures of possessions, and one thing we can’t say. One thing for sure is that families of long ago had significantly fewer possessions than even the 127 objects they now have; and two, as time goes on families will have more than they have now. Assuming a constant rate of consumerism, it is very plausible to imagine a time in the near future when the average American family of four will host as many objects in their lives as King Henry’s entire royal household did when it represented the wealth of England. What we can’t say is this: If we hold up two photographs from Peter Menzel’s book Material World, one of a Guatemalan family with their firepot and looms and not much else, and one of a Icelandic family with washer/dryer, cellos, piano, three bicycles, horse and a thousand other items – if we hold both these images in comparison, we can’t tell which family is happier. Is it the one with all the possessions, or the one without? The advance of technology seems not to have advanced happiness because we can’t pick the happier humans. If there is indeed no correlation between the quantity or quality of possessions and a person’s happiness, then why is one additional fact so certain: that everyone in the world who has a chance to increase the degree of technology in their lives, will? And they will. When given a chance people who walk will buy a bicycle, people who ride a bike will get a scooter, people using a scooter will upgrade to a car, and those with a car dream of a plane. Farmers everywhere trade their ox plows for tractors, their gourd bowls for tin ones, their sandals for shoes. Always. Insignificantly few ever go back. The exceptions such as the well-known Amish are not so exceptional when examined closely, for even they pursue selected technology without retreat. Technology is either a Siren, bewitching the innocent into consuming something they don’t really want, or else it is a type of depraved gravity which demands that all run downhill toward it. Or else it is a third choice: it offers something highly desirable, something other than happiness, that everyone yearns for yet can’t describe. The evidence of time favors the latter; that technology is neither devil, nor distraction, but is, on the whole, something people accumulate because it betters them and the world. This is a contrarian view for many of us in the developed world because the technology of communication and travel allow us to see the costs of technology and they are often not pretty. To a first approximation, the technium is the ten thousand items in my house. It’s the comfort machines, the convinience appliances and the entertaining gadgets that fill the homes of the 2 billion middle class of the planet. When these billions think of technological advance this is what they have in mind: the ocean of goods and services that buoy their lives with ease and diversion – telephones, anti-biotics, lights, cheap clothes, frozen fish, and cars. But these goodies are really the fruits of a very large tree. Behind the hi-tech items in my house are remote dark mines dug for rare earth elements, vast dams needed to power my computer, the stumps left over after timber for furniture is removed, the long chains of vehicles and roads needed to package and market it. These flows of technology form a huge tree with roots 20 feet beneath, sporting heavy trunks of invention which dwarf the tiny gizmos on sale. The ten thousand items we counted in our house are mere cherries in a forest. Part of happiness (not to be confused with serenity) is accomplishing goals. Technology provides the prospect of accomplishing more, and thus we envision a happier future, not taking into account–or unable to take into account–that the temporary surge of happiness obtained upon reaching that goal will be soon be diminished in proportion to the diminished effort. Thus, at any given moment, one may not be any more happy than one without technology, but overall, if their technology was put to good use, it should have provided more happiness in their life overall. Economists (my source is the book of Allen Greenspan) call this “keeping up with the Joneses.” Many of our consumption is driven by the fact we don’t want to fall behind in status compared to our neighbors. Biologists would point to the fact that in any social group status is of extreme importance and worthwhile to invest in because it increases your chances of survival and reproduction. Sometimes status is coupled to improvements that are of real value, sometimes it just isn’t and we buy fashionable crap just for the sake of maintaining our status. Either way, these kind of principles are what makes systems with extropy so damn interesting. My feeling is that the over-riding human drive is not for ‘freedom’ or wealth or glory – the usual suspects – but for security. In general, people will sacrifice almost anything to increase that. There’s a tale (I’m sure my version will be oversimplified) about the Bushmen of the Kalahari – surely one of the most integrated and adapted peoples on Earth. They used to know and use about 6000 different plants and animals as food: the limiting factor, of course, was water. So the government generously installed a few deep-bore water facilities for them. The Bushmen, within a generation, gave up a 50000 year old lifestyle in order to reside close to the water stations permanently. They now live on a very limited diet of about 20 items, provided by the government. Their desire for water security outweighed, it turned out, any other consideration. I’m sure they feel nostalgia and probably have their own form of country music which mourns their lost freedoms. I’m equally sure they won’t move away from the water stations. So the choice is always ours…buy or don’t buy, “have or don’t have”, if one can afford all the materials things or not they still buy them and go in debt to do so. The credit card is a marvelous thing. Long ago, while in Scotland, my Scottish wife’s uncle had his first car, this was before credit cards and it set in the Garage cause he couldn’t afford Gas to “run about”, as he said. So I filled it up and we went for a short distance then back into the Garage? “Didn’t want to empty it out, must save for an emergency!” “Gee thanks for the Ride”..so you see it’s all about the “Ride” one gets from having or not having something. “Having is a high, not having is a “Low” but even misers get a high? Yes, we really do have a choice – even when we say we don’t. It’s just that usualy we are not willing to pay the price for saying no to technology.